Mahindra TUV300, a sub 4-meter compact SUV offered by the Indian brand, is holding its own in its segment. It is larger than the rest, has a more utilitarian, no-nonsense image and is generally considered tougher too. 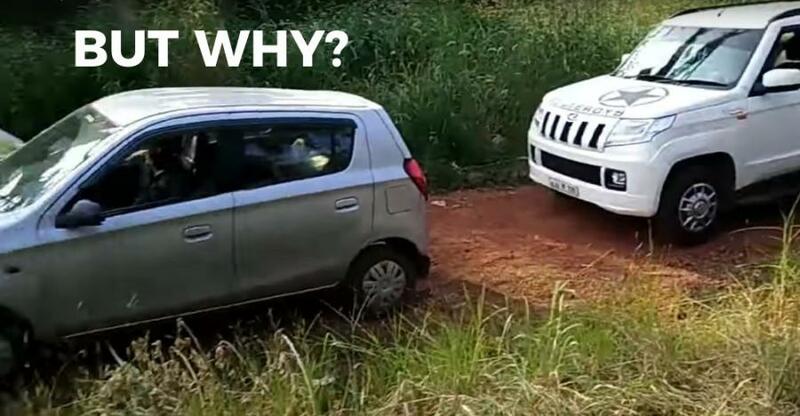 However, we recently came across this video of a Mahindra TUV300 struggling to get across a surface with loose gravel, with its wheels spinning. Before the TUV300, a humble Maruti Alto 800 tries it and crosses easily. How is this possible? The TUV300 is a rear wheel-driven SUV. The occasional wheel spin, it seems, is a known problem with rear wheel driven vehicles when driven on loose surfaces, with little or no weight at the back of the vehicle. RWD vehicles get power through a differential system. A differential is a set of gears that allows the opposite wheels to turn at different speeds. The different speeds of the wheels allow the vehicle to take turns where the inner wheels cover less distance than the outer wheels, without any screeches or tyre wear-tear. When one of the wheels loses contact with the ground due to the loose surface, it starts to rotate freely and the power does not reach the other wheel, resulting in the vehicle getting stuck. To solve this problem, differential locks are installed, which allows the axle to act like a single metal piece when one wheel is in the air. The TUV300 does not have the differential lockers and this makes the wheels spin whenever one of the rear wheels is lifted, leaving the vehicle stranded. There is no such problem with the Maruti Alto 800 – power is delivered through the front wheels which are weighed down by the engine, and the rear part of the car is pulled easily once the front wheels cross. This is also why small cars such as the Maruti Alto and 800 are so popular in Himalayan hill stations.